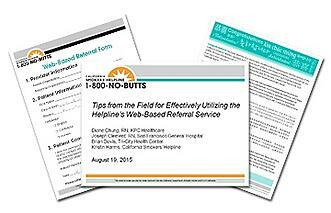 Web-Based Referral Form: Use this form to document a patient referral to the Helpline, including the patient's consent. Patient Flyer: Hand this flyer to patients after referring them to the Helpline so they know what to expect. To sign up for email notification of future webinars, please click here. Join hundreds of health professionals throughout California who are referring their patients quickly and easily to the free, evidence-based, tobacco cessation services of the California Smokers’ Helpline via our web-based referral service.